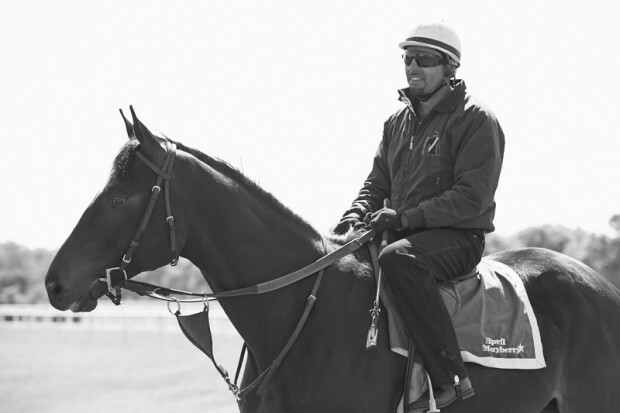 Cozmic One in training at Mayberry Farm, March 2014. Photo by Kyle Acebo. When do you put shoes on these yearlings? A: Coz had his first pair of shoes put on in February. We don’t put them on initially because they don’t need them here. There’s no concrete here—it’s all dirt and grass. The trainer gets a pristine foot. There are no nail holes and they aren’t cut a certain way. Also, when they have shoes it’s much harder to let them be out in the paddock. There’s a risk that they’re pull them off. What’s the difference between exercise riders and jockeys? Do they have different skill sets? Do exercise riders work for multiple farms? A: To start, it’s often their size and weight. The smaller riders usually aspire to be jockeys, to be famous riders. Jockeys wouldn’t necessarily know how to break a baby. They wouldn’t know how to get them nice and quiet, to gallop and stop a lot, to stop and stand. Exercise riders are more attuned to the “kids” as they’re part of the teaching phase. Most exercise riders work for multiple farms. A lot them will go to the tracks in New York and New Jersey to gallop, and then come down to work in Florida for the winter. Right now, we have so many horses that we have riders who just work for us. Our two main guys have been with us for almost seven years. We have them almost year round—they’ll take a month off in the summer. Why did they send Cozmic One to start training at such and early age? Why not wait into he was a full 2 years old before sending him to training? A: It’s a disservice to the horse, to us, and all the people around them to wait. By the time they’re three years old, they’re big and strong and set in their ways. It’s like finding someone who was raised by wolves. You don’t want to wait until they’re teenagers to teach them anything. You can break them early, and if they’re not ready, you can pick up again in the fall. Just because you break them it doesn’t mean they have to train. The exercise helps their bones develop and strengthen. In Europe horses jog up and down asphalt and cobblestone roads because it makes them stronger. That’s another reason you don’t want to wait longer—that older horse that you waited on is going to be a softer boned horse. Do you break all the yearlings the same way? Or is it individual based on their personalities, temperament etc? A: That’s another thing that makes us different from other farms. We don’t put our horses in a program; we develop a program for the horses. You can’t lump them all together. Our horses get a leg up because the training is tailored to them. Certain horses like certain people. If a rider doesn’t get along with a particular horse then we’ll have someone else get on him; we don’t force it. We take them to the round pens to teach them to turn, to stop, to trot; they learn figure eights and to back up. Some of them don’t like that, and if they really don’t we’ll skip it and go to the field. They jog and trot in the field and do big figure eights. 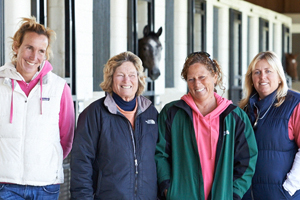 Jeanne Mayberry runs her farm in Ocala, FL with her daughters, April and Summer, and their cousin Jacki. Both Zenyatta and Cozmic One received their early training at Mayberry Farm. Jeanne’s assistant, Margarita, is pictured on the left. Lanes End just posted on another blog that Tasty had died in 2013 of an apparent heart attack and asked all fans to respect the owners privacy. RIP beautiful girl. Belmont Park barn of trainer John Shirreffs his home. Note: What appears to be a video near top did not work for me. Multiple graded stakes winner Successful Dan, the older half brother to two-time defending Horse of the Year Wise Dan, has been retired due to lingering ligament issues in his left front, trainer Charlie LoPresti said on Friday. Owned and bred by Morton Fink and out of 2012 Broodmare of the Year Lisa Danielle, Successful Dan flashed brilliance throughout the years but constantly had his career interrupted by his ailments. The 8-year-old Successful Appeal gelding won eight of 15 starts and became the first graded stakes winner trained by LoPresti when he captured the 2009 Grade III Northern Dancer Stakes at Churchill Downs. for careless riding incident that caused the 3-horse spill on Wed.
Love the ‘ask the experts’. Always enjoy learning more about these beautiful thoroughbreds, especially Zenny’s beautiful babies. It doesn’t make sense to say that breaking a horse at 3 is too late because they are “set in their ways” and like a pack of “wild wolves”. Plenty of other disciplines (like eventers, endurance, and polo) have strong, hot horses and start at 3. The Spanish Riding School seems to have no problems starting their stallions at 4 and they end up with strong, beautifully trained horses with working lives sometimes into their 20s.